What makes a poker player a fish or a shark? One necessary ingredient is experience and there is no substitute for that. One way to speed up your acquisition of knowledge is to listen to the advice of experienced players and to focus on some specific aspects of your game. The first fundamental element is to control your VPIP/PFR/AG. 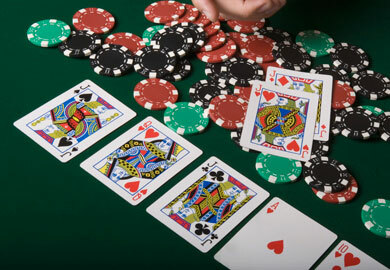 Many novice players want to play many hands and have atrocious VPIP of 50% or higher. Almost all winning poker players have a VPIP in the range [8-20] for full ring hold’em and [15-30] for 6-max hold’em. The three secrets of hold’em poker are: fold, fold and fold. A few exceptional players might be able to be winners with VPIP outside these ranges, but your initial goal is to stay within them. If you call too many hands, the average quality of your hand is low and the average result is a loss. Study a starting hand chart and play tight. The second thing to learn is aggression. If you play passively, all the neighboring sharks will smell your blood. Aggression is a difficult skill to master. It is similar to driving a F1 racecar. If you do not know how to use it, you will go very fast and you will crash very fast also. Normally it is believed that the optimal level of your PFR should be 2/3 of your VPIP, wherever the VPIP is. If you find out that your PFR is 2%, study your gave as there is something wrong with it. This is the PFR of a fish. Finally AG represents your aggression postflop. AG must be high enough as well, preferably above 2. It means that postflop you should avoid calling as much as possible. If your hand is strong, raise. Else, fold. Easier said than done, but it should be your goal.